How to promote Spocket and get paid. Once you have been approved as a partner for Spocket, you will have access to your referral link and assets. 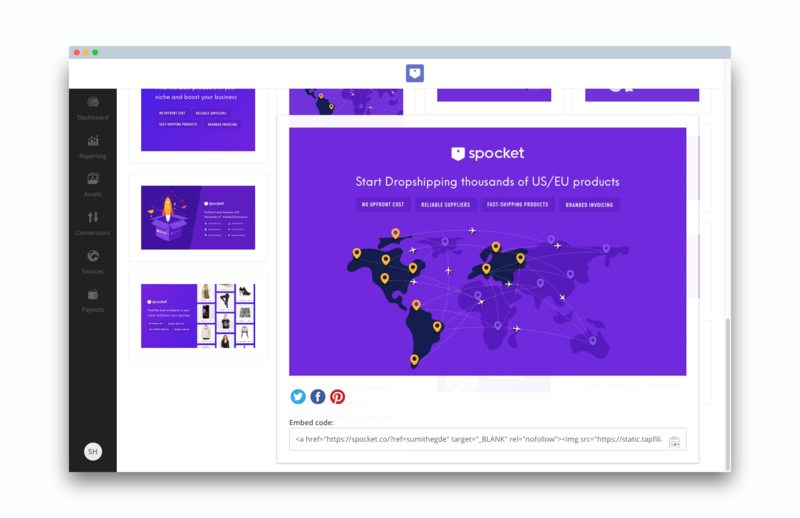 Assets are specially designed banners and posters that you can share to promote Spocket. The referral link will allow the viewer to install Spocket. When you view the assets page, you will be able to directly share the content on Facebook, Pinterest and Twitter. Make sure to include your referral link in the content- for that is what will count while mapping conversions. We recommend adding a line or two speaking about Spocket from your personal experience along with the banner you are sharing. This will help your viewers trust Spocket- with you vouching for it. 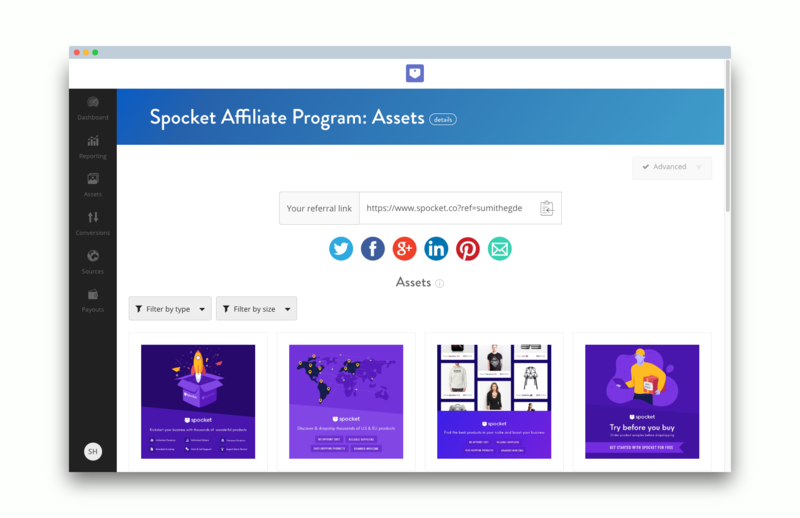 Furthermore, if you wish to promote Spocket using other media, you can download the assets and then share them. We will be sending you an email with all assets attached, from where you can easily download the images. You can also right-click save the assets to your computer from the assets page. If you market Spocket on platforms apart from Facebook, Twitter and Pinterest, do make sure to add these sources on the Sources page. Then, you will be able to track conversions and impressions on those sources as well. You can create YouTube videos talking about Spocket, create online courses about dropshipping and promote Spocket through it, let your Instagram following learn about Spocket through a post or story and so on. When viewers use your link to install Spocket, you will earn the benefits. To acquire payments, you can link your PayPal account in the settings- and this is where all your payments will be transferred. Every two months, we will approve all the conversions you have made and accordingly pay you for them. You can view the amount of the payment made to you in the Payouts section on your page. That is the summary of marketing and payouts with Spocket. Become a partner now- and earn your pay with minimal effort! Want to know more about your Affiliate Dashboard? Here's a quick read: A Guide to your Affiliate page.